Today we welcome Anna, from Noodlehead fame. She is sharing her must have supplies to keep on hand. Hi creative people! It's me, Anna, from Noodlehead. I'm happy that Chris asked me to join in on the Sewing 101 fun. 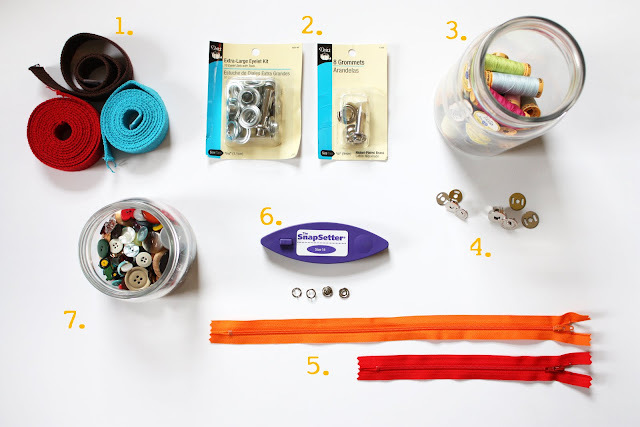 I don't claim to be any sort of expert over here, but I do hope that this post will help you out, especially on your next trip to the craft store! I'm hoping this will be a great resource for those of you new to sewing (and maybe some of you that aren't so new). Here are a few of the supplies I keep on hand at all times (hopefully). 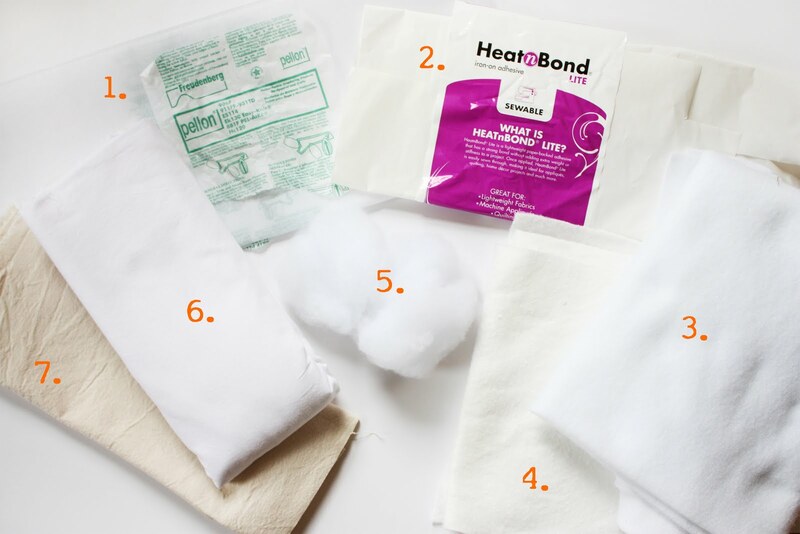 I used to find myself going to the craft store/fabric store all the time to buy basic stuff, but now that I know what things I typically make, I keep those ready to use in my sewing area. Just a few other notes, I always try and find a coupon to Hobby Lobby, Hancock fabrics (or Joanns), and Michaels when I know I need something. It's also a good idea to be sure to stock up on thread and maybe even some buttons you like when they go on sale at 50% off. Extra rotary cutter blades. I purchase mine at Michaels with a 40% off coupon. 45mm Rotary Cutter. I didn't picture the self healing mat, but you must have one to use with the rotary cutter, they come in lots of different sizes, but use a coupon! Smaller scissors for detail work. Needles. I've been known to go through 4 needles on a single step of a project before, so be sure to have a package handy. I use 11 most often, but 14 and 16 are nice for making bags, etc. Also pick up a few ballpoint needles for using when sewing with knits. Zipper foot! My friend. Also for making piping. Darning foot. For free motion quilting. I've used these on napkins, etc. You can do really cool stuff with this foot, just think of it as sketching with thread. Walking foot. Definitely buy one of these if you plan on making any quilts. It allows the fabric to feed through evenly, even when there are many layers. I use mine on bags, etc. as well. Chop stick, for poking out corners. Small flat head screwdriver for tightening the feet on my machine. Pins, definitely buy the nicest ones you can afford, it makes it so much easier to push through fabrics. Bobbins. Keep a few extras on hand. I rotate with about 8 bobbins, a must when you make a lot of different project. Clear grid ruler. It would also be a good idea to get one of those handy suction cup handles to make sure your fingers stay out of the way of your rotary cutter. Elastic. Sizes ranging from 1/4" to 1" in width. Velcro. I have 3/4" and it seems to work well for a lot of different projects. Safety pin. For pushing elastic through a waistband casing. Twill tape. I think it can add a lot of detail to a project as well as being useful for a 1001 other things. Spray adhesive. I used mine for my mail organizer, but I've also heard of people using it with making cards with fabric scraps. Cotton webbing. Fun for tote bags and more, lots of fun colors to choose from. Grommets. I like the special touch it adds to projects. I have 7/16" and 3/8"
Thread, lots of it, especially white, cream, brown. I like to use 100% cotton thread for quilting. Magnetic snaps. For purses, clutches, etc. I buy mine from BeingBags on etsy. Zippers, my favorite notion. I only keep 14" and 8" zippers on hand. If I need another length or an invisible zipper I make sure to buy it on my next trip to the store. I buy mine at Zipit on etsy. Snaps/snap setter. I use this brand, I really like the variety they have. Size 16 covers most projects I've made. Medium weight fusible interfacing. I also have a bit of lightweight interfacing. And it is handy to have some Peltex around (double sided fusible heavyweight interfacing). Iron on adhesive, great for applique. I have Heat n Bond, but I think Wonder Under is the same stuff? Fusible fleece. Great for bags, zippered pouches, give a nice padded effect and gives body. Polyester fill. For making softies, your own pillow forms, etc. Muslin. I use a lot for lining pillows and this is another one for 1001 other uses. Plain cotton canvas, great to use as a sew in interfacing for bags., etc. I'm sure there are some goodies I forgot, so please feel free to leave any of your favorite essentials in the comments section! I also want to note that these are the items I regularly use. I did not receive any monetary compensation (or otherwise) for my opinion on any of these products. Thank you Anna! I think we all have a few things we need to add to our shopping list. Love those 40% off coupons. Thank you! I love sewing what supplies other sewers use. 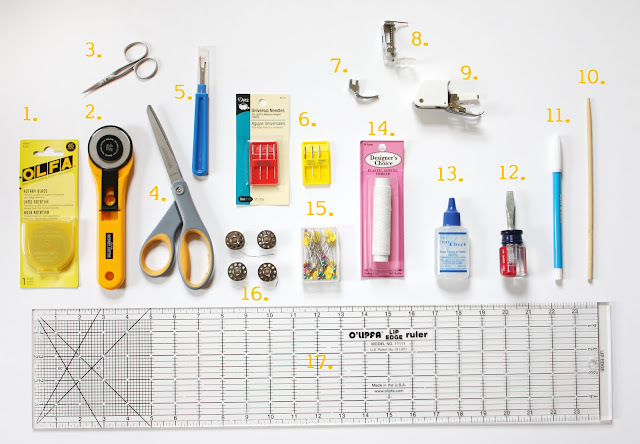 This is such a great post -- especially for those just learning to sew! Thanks so much for leaving such a nice comment on my blog today about my "art gallery." I appreciate it so much! What a thorough list (and beautiful pictures)! Thanks for having me Chris, twas fun! Hi, I found you on Pinterest, and this post is so great that I had to share it with my readers. thank you for being so awesome! Found you at thediydreamer.com. Thank you so much for sharing this information. I have some shopping to do for sure! ;) Definitely a big help on my sewing adventure! 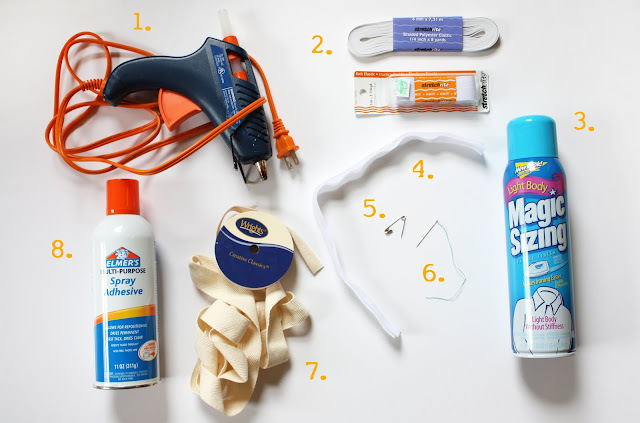 This is a great list for us beginner sewers, trying to learn our way! I'll be keeping this page bookmarked. Super helpful, thanks so much!